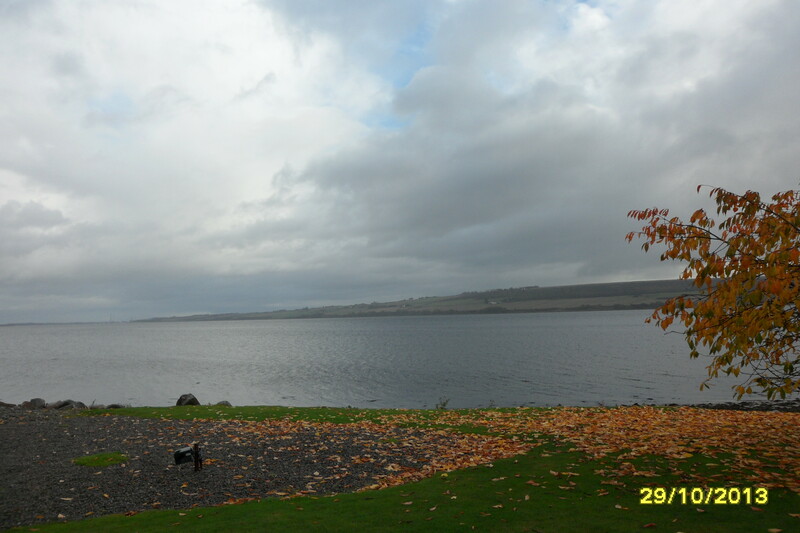 We set off from Kingsmills Hotel Inverness on the Tuesday, fortified by a large breakfast, and knowing that the weather was likely to be a bit unpleasant. Fortunately we had not had the terrible gales and rain which England and Europe had experienced the previous day, but still, it might not be nice. The east of Scotland is usually colder but drier than the west, which has the Gulf Stream to influence it , but not this time. The road north takes us along the continuing A9, over the Kessock Bridge. This divides the Beauly Firth and Moray Firth (sea lochs), but joins the ‘mainland’ with the Black Isle Peninsula. The Isle does not deserve this description, as it is a bright, flat, lush. 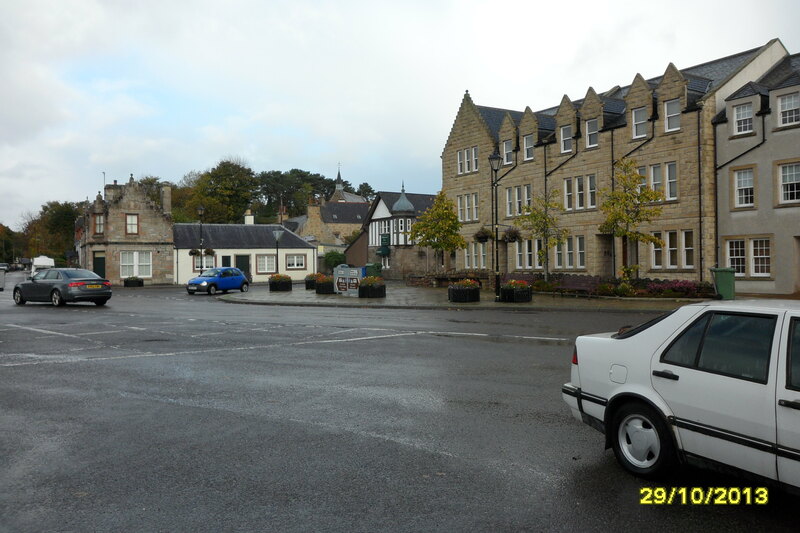 area, criss-crossed with many pretty roads, with a long coastline, and villages and small towns such as Cromarty (of weather forecast fame), Rosemarkie, Jemimaville and Fortrose. When crossing the bridge, luckily the weather was OK but showed signs of worsening weather. We were now travelling in an area well-known to our family, as these were the lands of the Munros of Foulis Castle in Ross-shire. Born in N Ireland, I claim descent from Prince Ocaan of Fermanagh (of about 1000AD) the chief of a Scots clan which had been driven from Scotland in the fourth century, by the Romans, to Ireland. 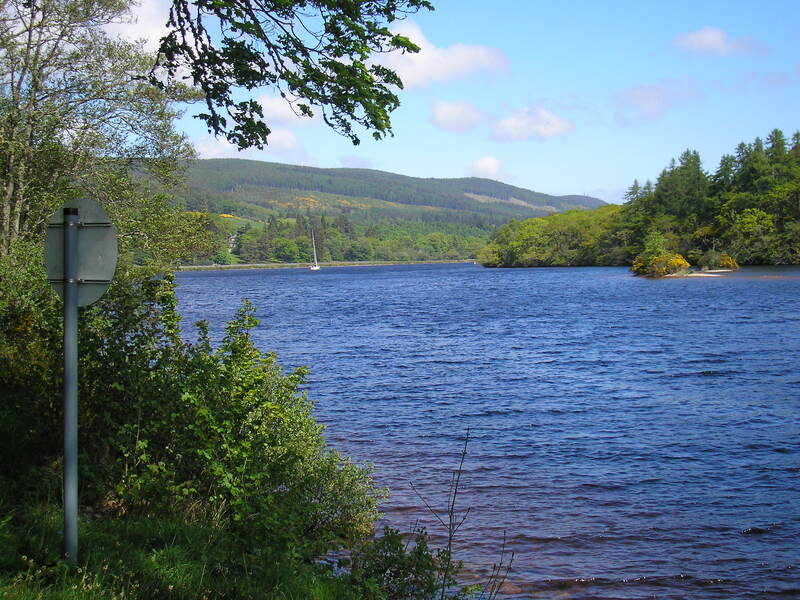 The clan had lived near Loch Foyle on the River Roe near Londonderry (from whence the name Munro, or Monroe, was derived). His son Donald then took the clan back to Scotland, and after fighting for King Malcolm 2nd in 1025, he was given a Barony (which he named Foule or Foyle) and was granted lands in Ross-shire. Hence the name Foulis Castle at the town-land of Evanton. There is normally a wonderful view of it from the Black Isle, but not today. I described the view, and called the castle a beacon, in a poem I wrote for the Clan Gathering, many years ago. If any Monroes or Munroes want a copy I can get it to them or post on the clan FB page. A number of years ago the Clan Chief established a rather pleasant eating place and shop just as you come off the Black Isle. Called ‘The Storehouse of Foulis’ it presented good food and information about the Munros, and the usual momentoes for those interested. It has now passed into other hands but is still an excellent location for a stop. But we still had some distance to go, and the storm clouds were gathering. Farewell to the area, and hoping to be here again next year at the next gathering, we sallied forth. We were going to an area where road fuel is sold only in a limited number of places, so were astonished to discover that at our first petrol station it was available cheaper than we get it at home…..so filled-up at Tain. Dornoch. It has a rather sophisticated and dignified appearance with a lovely large square with Courthouse, Jail, and Police House…..obviously a peace-loving area! It also boasts a Church of Scotland Cathedral……one of only a few. We were fortunate and privileged some years ago to be asked to do work on the sound system and it was a very-pleasant experience. So we had to pop in and were delighted to see that our original wiring was still there. The photo looks toward where the altar would be in an Anglican cathedral, but here it is simply an entrance door. It is a beautifully-light area with large stained-glass windows. Unfortunately the weather was worsening and we had no chance to spend much more time in what is a delightful town. It is a great holiday/fishing/countryside/seek-the-Scottish ancestors, sort of place, so it is well-catered-for with regard to hotels and guest-houses. As a curiosity there is local accommodation called www.fourpenny.net. So you may like to look at it. North of this is where the scenery becomes really spectacular as the coast road allows us views of great headlands and deep valleys, or glens….when weather permits, of course. 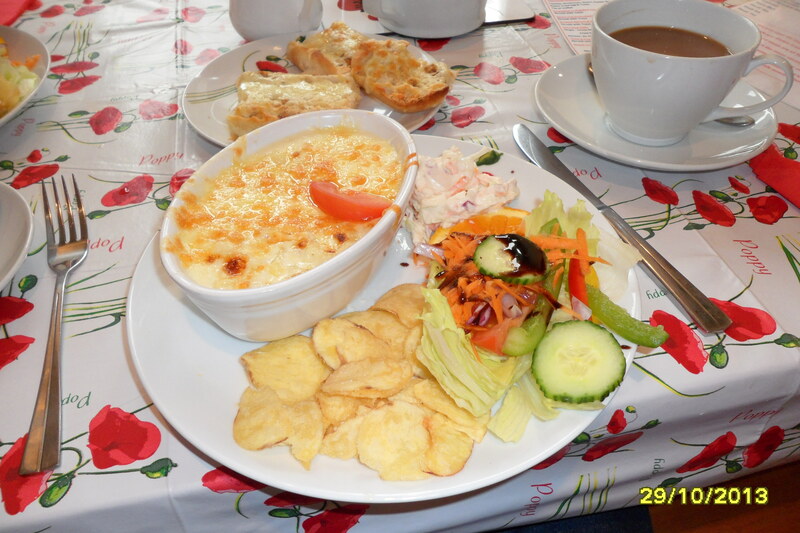 It was not terribly kind to us in that regard, so we called-in at Golspie for some nourishment, at ‘Poppies’. The tablecloth design says it all! We passed through Brora, Helmsdale, Berriedale, Latherton etc, but with poor views due to mist and cloud, before arriving at Wick. It had meaning to us as we once were asked to come and sort a problem in a Church sound system (we had not put it in!). We travelled from near Glasgow one Sunday, sorted the problem the next morning, and returned home on the Monday! Not to be recommended! John O’Groats was but 20 miles north of this, but we preferred to go to Dunnet Head, which is the true most-northerly-point on the mainland. The shades of evening were descending but the cloud formation was spectacular. We could not stay long at the sands as the light was fading fast and so we made tracks for our overnight stop in Thurso, Pentland Lodge House. Because of the proximity of the sea, almost all restaurants advertise themselves as the ‘Best Seafood Restaurant in the north of Scotland’. We decided not to go into the town to eat, so dropped down to the local fishing harbour of Scrabster, where we found the Ferry Inn, and ‘Upper Deck’ Restaurant. 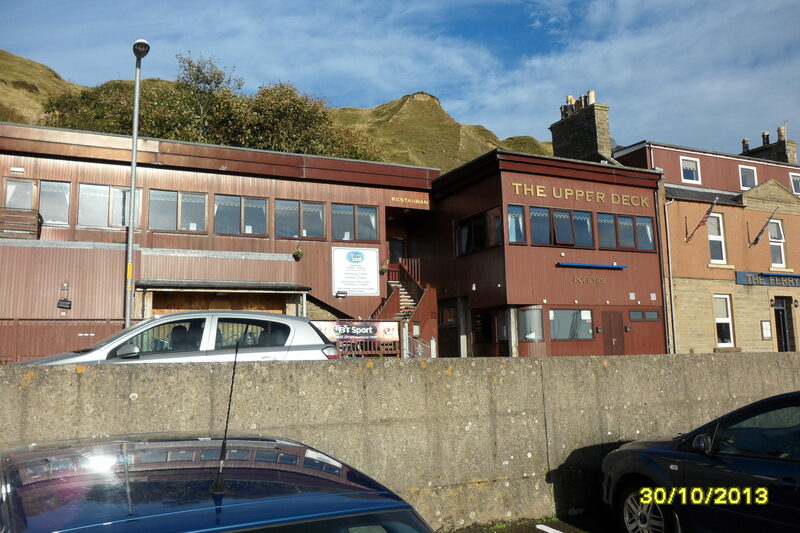 It nestles into the local cliffs, and commands a view over the harbour. I can’t pretend that it is looks exactly a beautiful or ostentatious building; in fact it almost looks like a giant set of wooden packing cases! It was gratifying, then that when we went in, we saw a clean, airy, immaculate restaurant, with cheery staff and a good menu. You probably do not need two guesses as to what we ate……yes, fish! Then off to bed…..for we were about to have our longest day trip on the morrow….. This weekend was another holiday here, so there was the opportunity to head north with Young Lady of the House, and Daughter, to the Inverness area and beyond. 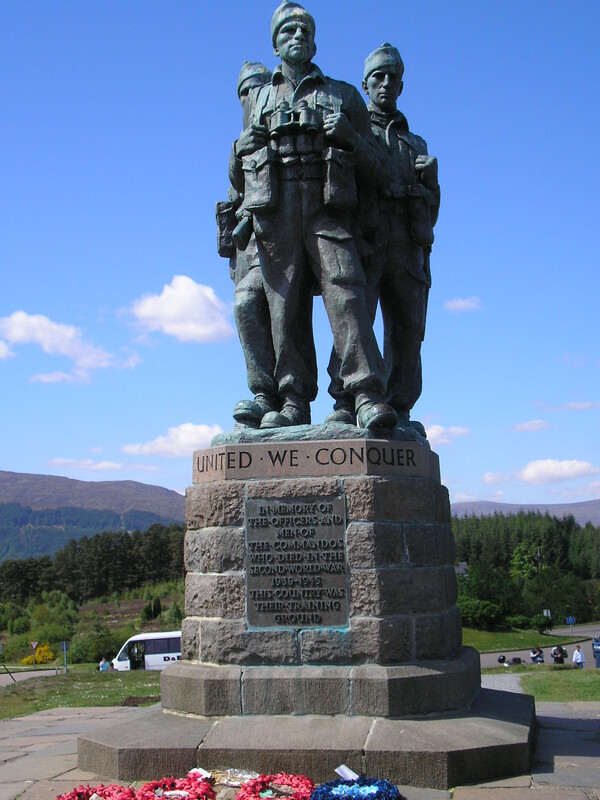 Our first stop was at Spean Bridge, north of Tyndrum, where there is a beautiful viewpoint and a memorial to Commandos who had trained here service during the war. No matter how many times we see it, it still has the power to produce an emotion about events, just before our lifetime. We have long-established friends who have the good fortune to live in the Inverness section of the Highlands……and we shared a couple of good meals with them. 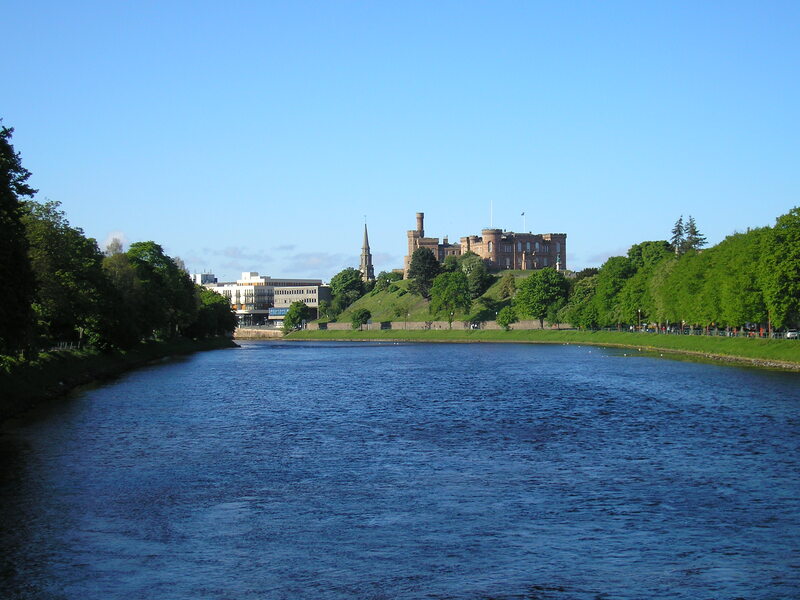 The City of Inverness straddles the River Ness (obviously) which is picturesque, although just now it is low with the lack of rain! Sunday was so hot that we went to the head of Loch Ness (no sign of Nessie! ), and watched the tourist boats going through the canal between the Loch and the river going to the sea. 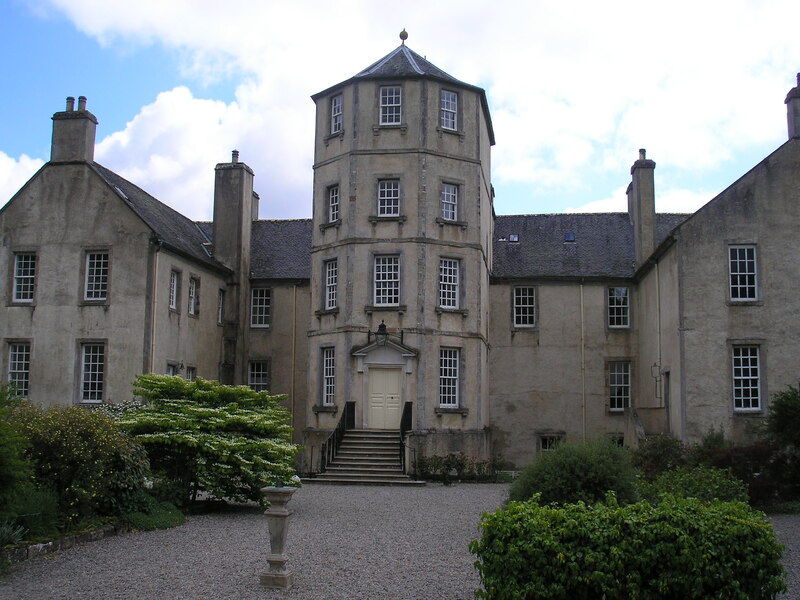 But most of all we wanted to call again at Foulis Castle, our ancestral home, in Evanton near Dingwall. The photo here shows how well-preserved and beautiful it is. (You can ‘Google’ it and get a large amount of information about life in the time of the Scottish clan system) We have been here many times before, including one of the Clan gatherings a few years back. I had written the ‘calling poem’ for the last Gathering in 2007, and it was published in the Clan magazine. We had to cancel our attendance, unfortunately, at the last minute, and so it was time to get the ‘Clan-Family fix’. 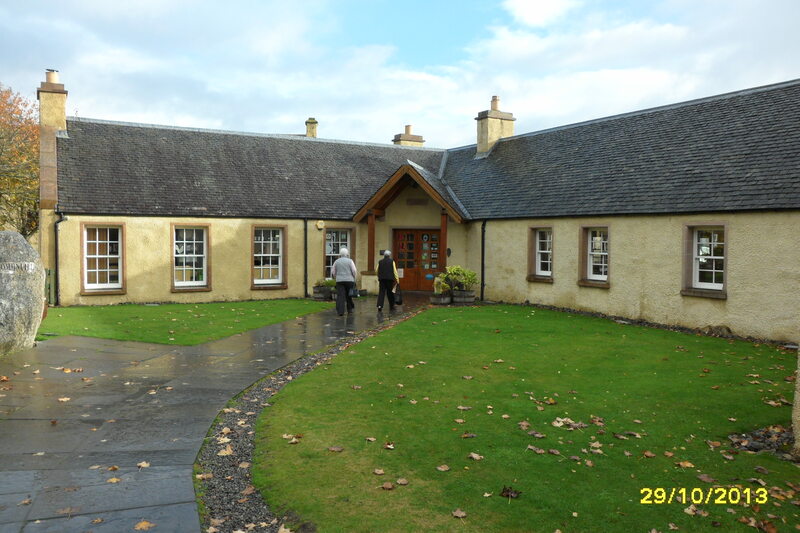 It is still a lived-in home, and we met-up again with the mother of the Clan Chief. She is a very gracious Lady and has an in-depth knowledge of the Clan, and the Castle. We were particularly keen to see how her garden, in the large courtyard of the castle, was getting-on, as she has tirelessly worked on it over the decades since we were there first in 1969! We weren’t disappointed in any way. At 83, her brain is still sharp, and knowledge of the clan is now even more detailed. She has reconstructed the old kitchen in the basement, and two wonderful self-contained apartments have been built, with a respect for the existing building and incorporating many of the old artifacts. 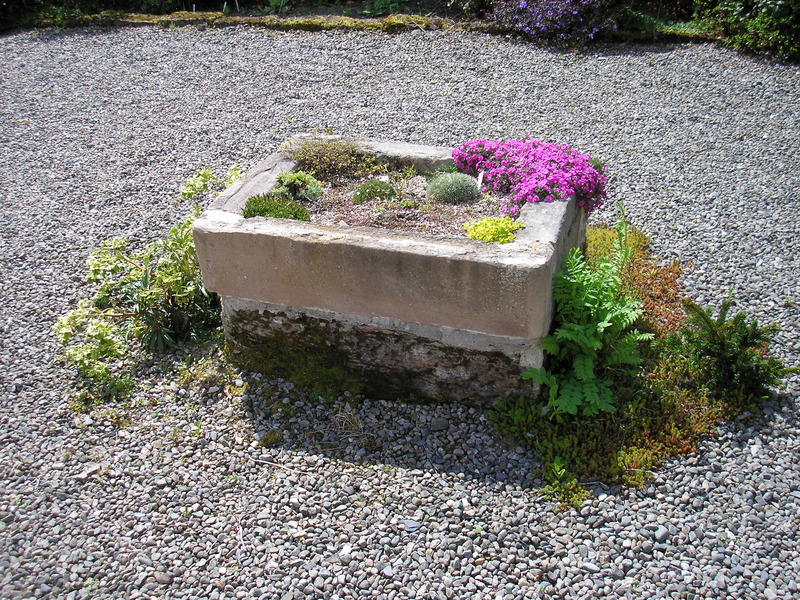 The garden in the courtyard has developed immensely, again with the eye for detail. The weather was beautiful, in contrast to south of the country, and so we returned tired, (special thanks to Daughter who did the long periods of driving in her new car), and very pleased with the visit to our ‘Home from Home’.